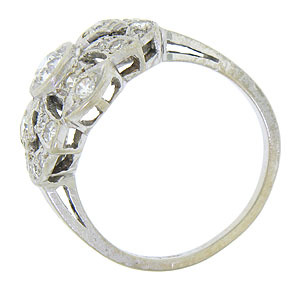 A brilliant .43 carat round cut diamond glows from the center of this breathtaking 14K white gold engagment ring. 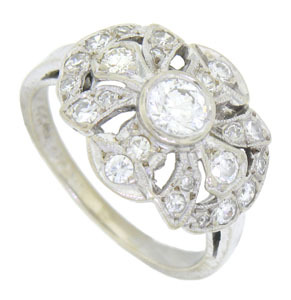 The antique ring features a wide collar of floral inspired cutwork set with approximately 1 carat of additional fine faceted diamonds. 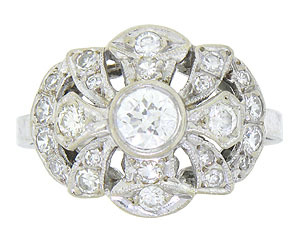 Delicate milgrain decoration outlines the romantic design. 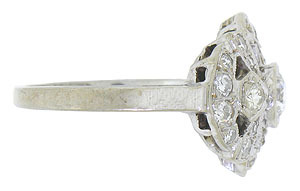 The Art Deco ring measures 15 mm in width. Circa: 1920. Size 8. We can re-size.